My husband and I have each been to Paris separately and it’s a place we’ve both been eager to visit again. This Spring, we decided to head to Europe with our kids for our first trip as a family of four. We went with family friends to Madrid and Barcelona and enjoyed ourselves. Our last stop was Paris and it was the best way to end our trip! We were worried that Paris might not be the best city to visit with small children, but our fears were unfounded. 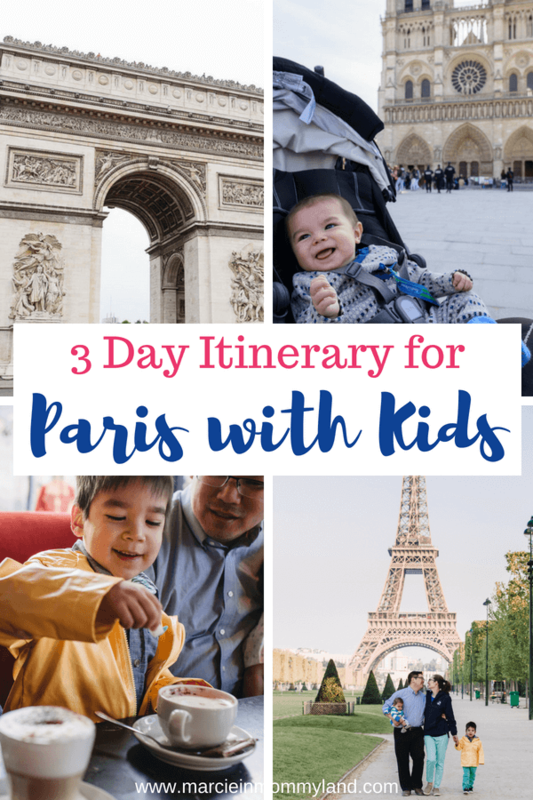 See what to do in Paris in 3 days with kids. Plus, find out how to do a day trip to Disneyland Paris. 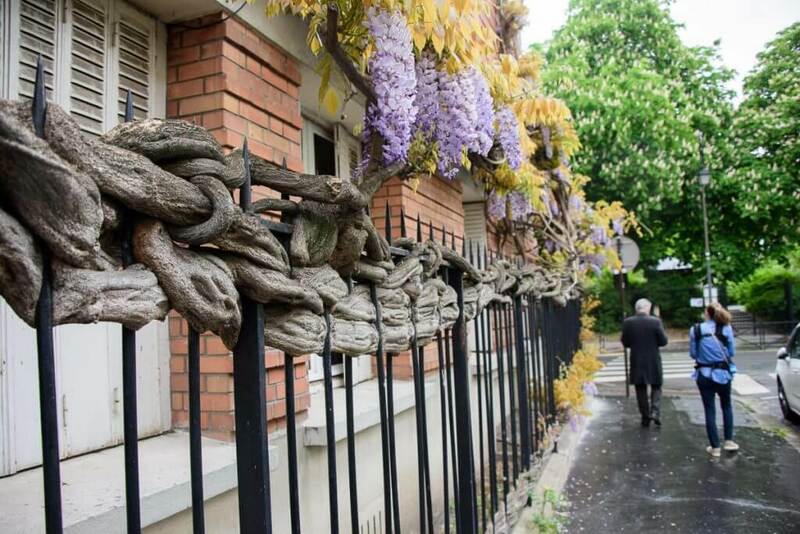 We enjoyed a free 3-hour private walking tour of Boulogne (suburb of Paris) through Paris Greeters. This was a great way to see how real Parisians live. We put the baby in our Tula baby carrier and our 3 year old rode in the stroller. Read more in my full blog review. 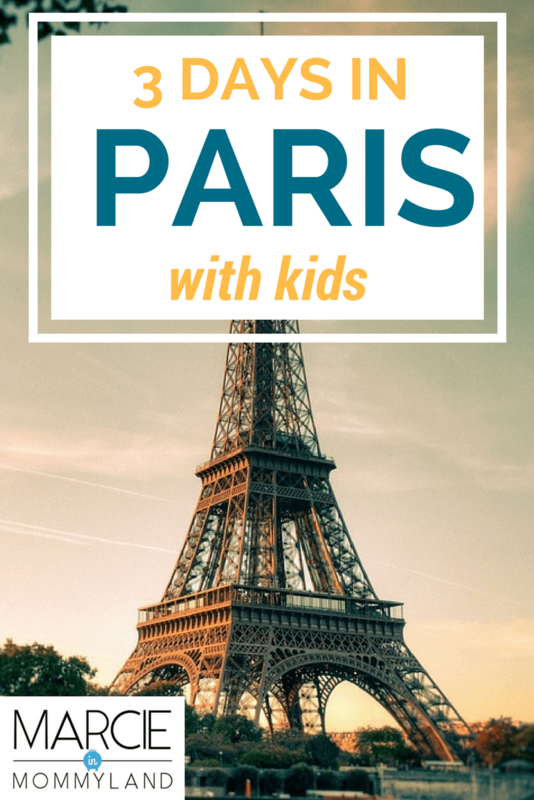 This is a great free thing to do in Paris with kids. After the walk, we enjoyed coffee at a cafe in Boulogne before heading pack to our flat via Metro. This gave us time to use the bathroom, change a diaper, and reload our backpack. Then, we grabbed sandwiches on baguettes from the shop next to our flat and waited for our TukTuk driver to pick us up. Our Paris by TukTuk driver Arnaud was very knowledgeable about the city and our 3-year-old had fun waving at motorists and pedestrians from the back of the TukTuk. We were also able to drive on the sidewalks to avoid major traffic jams! Read more in my full blog review. 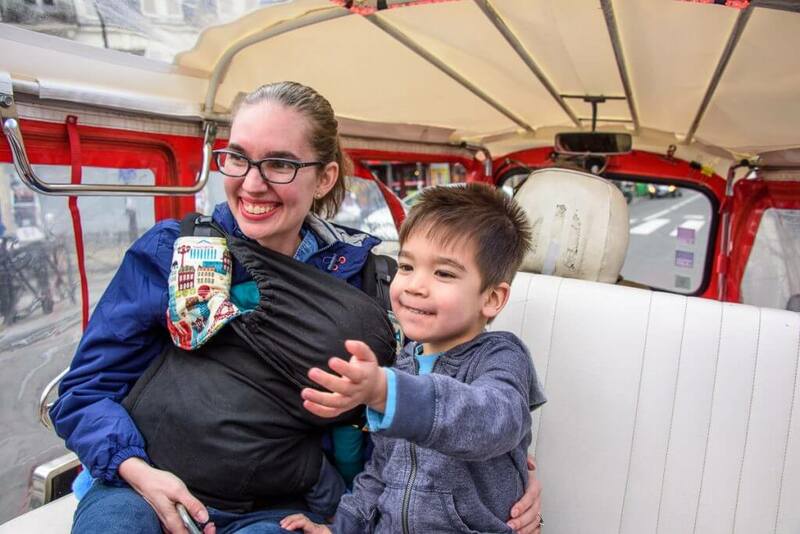 Exploring the city by TukTuk was definitely an unusual thing to do in Paris with kids! We stopped at a scenic lookout where my husband showed our 3 year old how to take photos of the Eiffel Tower. We hopped back in and finished our tour driving on major streets in the heart of Paris. Arnaud dropped us at Saint Germaine neighborhood where we grabbed an early dinner of beef bourgignon and steamed mussels. We had arranged for a Flytographer photo shoot at 7:30am. It was insanely cold for Paris in April and we didn’t pack warm enough clothing. We layered clothing on the kids and my husband and I wore souvenir jackets we picked up. Not exactly what I had in mind but the photo shoot itself was a good experience. Our photographer Olga was so sweet and personable! We got family photos at the Eiffel Tower, inside a warm cafe (which perked the kids up) and at the École Militaire. After our photo shoot, we had breakfast at a very pricey cafe near École Militaire (hint: if you only see businessmen eating somewhere, you might look for a different cafe.) But, our kids were freezing and we needed to thaw everyone out before heading back to the flat. Then, we walked along the Seine river while our 3 year old slept in the stroller and our baby slept in the Tula until we got to our flat. This almost felt like a mini-date as my husband and I could just enjoy Paris and chat uninterrupted. We got back to the flat and layered more clothes on everyone and packed up our backpack. From our flat, we walked to the Arc de Triomphe. They had a spot to park our stroller and invited us to use the elevator since we had a baby (in our Tula) and a preschooler. We still had to walk 42 steps in a narrow staircase to get to the observation deck, but our 3 year old managed easily. The observation area felt very safe for our 3 year old and we were able to let him explore. My husband helped our preschooler look through the telescope to see the Eiffel Tower better. There was also an elevated spot for selfies. We headed back down to the base of the Arc de Triomphe and my husband took photos while my 3 year old ran circles around me to get out some energy. If you’d like to know how to explore the Arc de Triomphe with little kids, read my full blog post. We started to get hungry, so we strolled down the Champs-Élysées to find food. This is one of the busiest tourist areas, but we had a hungry preschooler with us. We enjoyed crepes at a place right off the Champs-Élysées. We also used this time to plan the rest of our day. We decided to go shopping so we wouldn’t have to worry about it on our last day. I had a long list of items to get at Monoprix and Monop’ and we had shopping lists from family members for specific items and specific stores. We ended up shopping for a few hours while the boys slept. We packed everyone on and in the stroller and realized we had to take a taxi back to the flat just to transport everything. My husband was on the lookout for Duck Confit so we headed back out in search of this dish. He had checked Yelp and found a few places near our flat that were supposed to offer it, but none of them ended up having it. So, we started walking toward the Eiffel Tower hoping to find somewhere along the way. We didn’t find anywhere. We arrived at the Eiffel Tower around 8:30pm and explored the base. 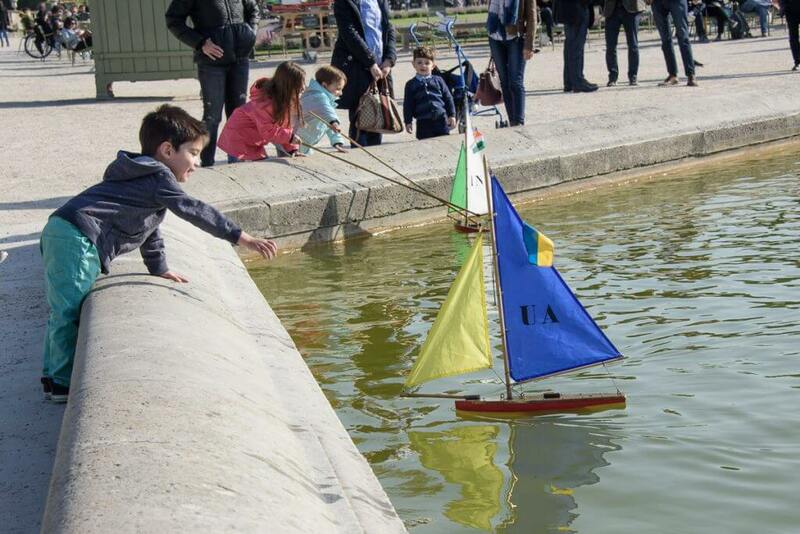 This is a free thing to do in Paris with kids. The line for the elevator was 45 minutes long and we were all getting cold. Our 3 year old spotted the carousel across the street and had his heart set on riding it. We decided that would be a better memory for him that standing in the cold. So we crossed the street and our son thoroughly enjoyed the carousel ride. We were hoping to see the Eiffel Tower sparkle but we weren’t sure when it happened. We saw it sparkle about 1 minute after we got in our taxi to head back to our neighborhood. While my 3 year old and I were mesmerized, my husband was lamenting the fact that he could have photographed it had we stayed just 5 more minutes! C’est la vie! We had the taxi drop us off at a restaurant who had a line out the door the first night we arrived. It was an awesome restaurant that only served steak with an amazing sauce and french fries. We sat down and the waitress asked us how we like our steak. She then wrote it on the table and came back with freshly cooked steak and fries! She just kept coming around refilling everyone’s plates with steak and fries and it was amazing! When we couldn’t eat any more, we wobbled back to our flat. On our third day, we slept in a bit and then took the Metro to Notre Dame de Paris. We looked at it from the outside and debated waiting in line to look inside. I’d already seen the inside, but the rest of the family had not. We decided since it was our last day to just enjoy it from the outside and continue on. We walked a few blocks to Sainte-Chappelle. I remembered being in awe of this church on my first visit to Paris and my husband had never been. There was hardly a line and we were able to park the stroller on the first level of the church. It was just as gorgeous as I remembered and our 3 year old kept saying “wow!” and our baby just kept staring at the beautiful stained glass. There were chairs available so I sat with the kids while my husband took photos. We were all getting a bit hungry so we walked across the street to a cafe for an early lunch. I thoroughly enjoyed my Croque Madame sandwich and shared it with our preschooler. Spirits were good, so we planned the rest of our day. We took the Metro to Sacre-Coeur and walked up the back streets to get there. That’s when our son spotted the little train that tours around and he decided we HAD to ride it. When we got to the front of Sacre-Coeur, we found out that the next train would leave in 35 minutes, so we had plenty of time to look inside the church. We were also able to see a beautiful panoramic view of Paris. Had we not been so tired, we would have climbed up to the Dome to get an even better look. At this point, our 3 year old was worried that the train would leave without us, so we decided to get on board. The little Montmartrain toured us around Sacre-Coeur and throughout the artsy area of Montmartre and the burlesque area of Pigalle. We saw the famous Moulin Rouge and many stores featuring lingerie, etc. Our 3 year old was fully passed out at this point. 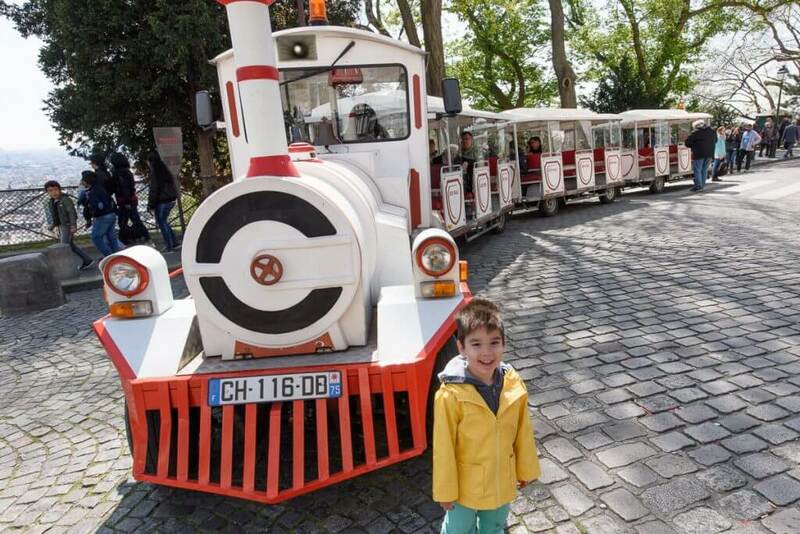 The train ride was about 35 minutes long and is an unusual thing to do in Paris with kids. We got tickets to ride a little gondola down to the base of Sacre-Coeur. It was a quick ride but saved us many steps. At the base, we decided to grab some crepes and drinks and headed to the little park on site. It was late afternoon and the park was filled with French children who were nibbling on sweet treats before playing. After awhile, our son noticed the carousel and was eager to take a spin. I thought it’d be a good opportunity to let our baby ride his first carousel, too! Next up was Jardin du Luxumbourg. We tried to take the Metro there but at the connecting station, there was an issue with the train and it wasn’t moving. It was insanely crowded and my husband almost had his wallet stolen. But, we got out of the station and looked for a taxi. We were at Gare du Nord and things felt sketchy to us, so we quickly walked a few blocks and then grabbed a taxi to take us to Jardin du Luxembourg. This was one of my favorite stops in Paris! For just 3.5 Euro, we were able to rent a vintage toy boat for 30 minutes. This is a cheap thing to do in Paris with kids. We got there just before they closed and our son was in pure heaven for those 30 minutes! We also hit the sandbox area after and our 3-year-old played with French children who were so kind to share their sand toys. For our last dinner in Paris, we were determined to find Duck Confit and we found a place near Jardin du Luxumbourg. We enjoyed our last dinner in Paris and grabbed a taxi to take us back to the flat so we could pack. We rented a flat through AirBnB that was a 10 minute walk from the Arc de Triomphe. It was much cheaper than any hotel I could find that was near a Metro stop and near attractions. We were on the 6th floor and while there was an elevator, we were only able to fit 3 people total (with no bags.) My husband usually sent me up with the kids first and then he’d take the stroller and backpack with him second. I liked that there was a microwave and fridge so we could eat a bit in the flat. It was also near a taxi stand, which was helpful when we headed to the airport with all our luggage. We found that almost every restaurant we went to assumed we’d want a hamburger and french fries for our 3-year-old. This was a bit frustrating as our son usually tries new foods and doesn’t really eat hamburgers at home. But, once it was offered, he seemed to think that was his only choice and he primarily just ate french fries. I’d recommend just sharing whatever you order with your preschooler, if they are interested in tasting new foods. And we found freshly squeezed orange juice (at a range of prices) at almost every cafe and restaurant and our 3-year-old LOVED it. You can squeeze it yourself at Monoprix for a fraction of the price and drink it at your flat. I’m usually pretty discrete and wore nursing tops but didn’t use a nursing cover. I didn’t get any weird looks and felt comfortable nursing on the Metro, in cafes/restaurants, and at parks. My youngest son is breast-fed but I ended up getting the stomach flu early in the trip and my milk supply dropped. I was also shocked to find baby food pouches that were 5x more expensive than the U.S. I had been hoping to try French baby food, but at those prices, I refrained. I’d recommend packing your own formula and baby food. We were really 50/50 on whether to bring a stroller to Paris. We usually wear our baby in a carrier and our 3-year-old has no problem walking around all day. However, my husband and I both were glad to have it. After walking all over Madrid and Barcelona, our 3 year old was tired and needed breaks in the stroller. Plus, he was able to nap while we were out and about. It was a bit cumbersome to carry it up and down the Metro stairs but we made sure to keep the stroller storage area empty so we could quickly fold it up. And when we went shopping, it was great to load our bags on the stroller and then just taxi back to our flat. Many restaurants also held our stroller at the front or advised us where we could store it while we ate. e not only enjoyed the process of actually buying the medallion, but he loved holding them and looking at the pictures on them. He started looking for the machines everywhere we went and it was kind of like a fun scavenger hunt. I’d also recommend visiting Monoprix for affordable food souvenirs (like cookies, dijon mustard, chocolate, etc) and Monop’ for fantastic beauty/health items and the cutest baby/children’s clothing. We ended up having our 3 year old wear Pull-Ups when we were touring around Paris. There were often lines at the bathrooms at attractions (expected) and most of the restrooms at restaurants seemed to be down spiral staircases that took awhile to get to with a preschooler. By wearing the Pull-Ups, we saved ourselves from having multiple changes of clothes for each outing. We didn’t use Pull-Ups for the first half of our trip and we went through almost all the pants we had brought and didn’t have an opportunity to wash/dry them. 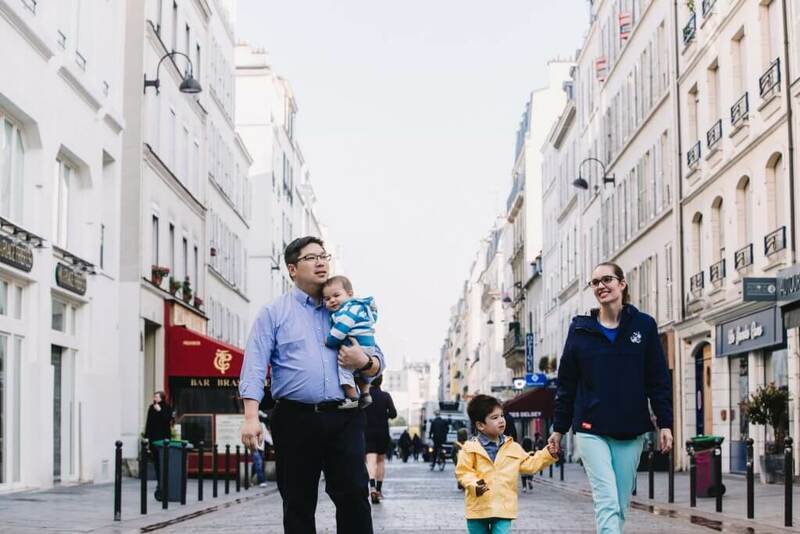 Is Paris with Kids a good idea? 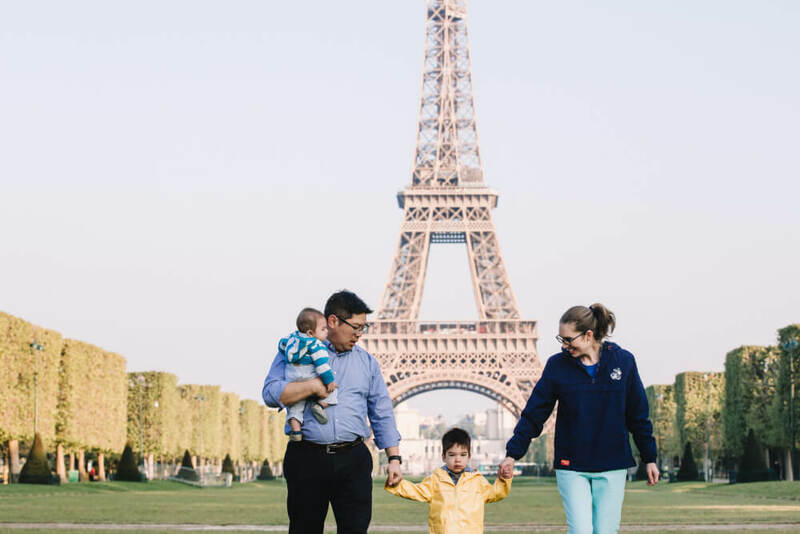 I definitely recommend Paris as a great destination for families with babies, toddlers and preschoolers. We found the French people to be so nice to us! Three days is just not enough to really explore. If we had a few more days, we would have spent half a day at Jardin d’Acclimation in Boulogne, got tickets to go to the top of the Eiffel Tower, eaten ice cream at Berthilon at Ile Saint Louis, rode The Big Wheel at Place de la Concorde and done a Seine boat cruise. We specifically didn’t go to any museums this trip because we’re hoping to come back when the kids are older. This will give us a good excuse! The best way to experience the famous Louvre Museum in Paris with kids is with a private tour. Choose either a 2 or 3 hours tour with an experienced tour guide. This private tour will be tailored to your family’s interests. This tour is perfect for families with young children. It’s 3.5 hours long and includes fun activities to keep kids engaged. Plus, you can skip the line. Kids will love exploring the beautiful gardens at Versailles Palace. This fun family tour includes an activity booklet your child will use to unveil the secrets of Notre Dame! It’s a 2 hour tour full of adventure, mystery and archeology! Paris by TukTuk offered us a complimentary tour for an honest review. All opinions are my own. It;s not easy to travel with kids when they are little, but I always found that being prepared was key. LOTS and LOTS of snacks. I love Paris! so beautiful! I went there when we lived in England when I was a kid. Great tips! We are going to Cancun for 3 days in June and taking it as a family vacation. Our kiddos are 9, 5, 3 and 3 months so I’m looking forward to seeing how it goes. Looks like those little guys are loving paris! I know I would! I have always wanted to go to paris and did not know if was so kid friendly for vacation. It’s one of my dreams to get photos professionally taken when in Paris! It’s too bad you didn’t get photos of it all lite up, but the photos you do have are amazing! Wow! I’ve never been to Paris, but I plan to visit there one day. I love your pictures. Your experience sounds amazing. I know you had a toddler but he will have memories to cherish forever. Yes, he’s already asking when we can go back to see the Eiffel Tower! I absolutely love your photos here. I also love the fact you organised a photoshoot while in paris! What an awesome idea. Good to see you can still have fun holidays with small children in tow! My partner and I don’t have babies yet and love to travel the world, so this is reassuring! Yes, you CAN travel with kids! It’s just a different trip. It’s been fun to meander a bit more. Looks like you all had a trip that you will always remember. What a great age to bring the kids to explore a different culture. There is so much to be learned with travel. Yes, our kids are learning a lot about other people and places. Yes it was a lot of walking. Thankfully our kids slept a lot in the stroller! Taking a tuktuk is such a smart idea when traveling with little ones. It still gives you a way to see the city without worrying about the kids getting tired to quickly. What an amazing adventure Marcie! Love all the itinerary details & how need that you tried out Flytographer! I’ve been hearing so much about that service, and it seems like such a great souvenir for a big trip like that! I think I’m hooked on Flytographer! I’m hoping to have that be my big gift each year. Looks like an amazing trip. My kids (3 and 5) are in a French immersion school and we are planning to take them in the next year. Great tips for the little ones. Awesome! My oldest has been in Mandarin immersion and we’re hoping to head to China in the next couple of years. Learning another language is so beneficial! wow fun family vacation and you definitely had some great tips while traveling with young kids! What a fun trip and excellent itinerary. I’m glad you embrace traveling with kids rather than shy away from it. Yes! Our kids are getting used to travel and it’s been fun having them explore with us! What an amazing family trip for you all! I would love to take my kids to Paris, we have YEARS before that can happen though! The picture with your son and the sailboat is precious. I would have that hanging in my house! You all made lasting memories. Loved being able to read about it. What a wonderful trip and memories for your family! 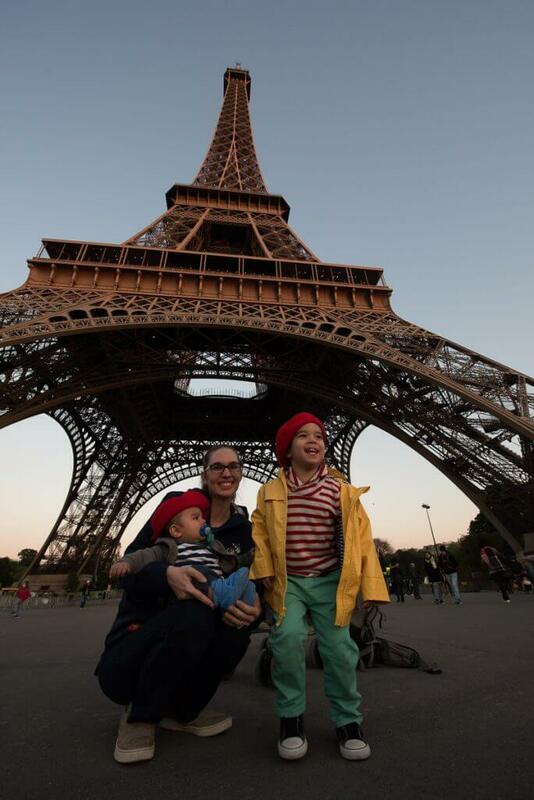 My friend just came back from Paris with her 2 kids and said that her boys had a blast! I want to go to Paris so bad! Your pics are wonderful and looks like a great time had by all! It was phenomenal! I want to go back already! Oooo so many great tips!!! We have been traveling with my daughter since she was a month old. Traveling with kids isn’t as hard as people make it out to be. I have never traveled to Paris with a baby. I think it’s great that you still get to explore as much as you want with your baby. I love walking tours, they’re a great way to see the city! Walking tours are so helpful because of the personal connection with having a guide. What an amazing experience at such a young age! We travel a lot, but mostly cross-country to visit family, and we do a good job exploring our state. We just need to branch out into other countries! I want to explore more of the U.S. next! Sounds like you had a jam packed few days in Paris! You got up to lots of lovely things and seemed to have a great time with your little ones. Thanks for the helpful tips! Yes, it was much too short but we had so much fun! These are some great tips! Mine are older now, so I wouldn’t have to worry about some of that, but I am really looking forward to whenever I can take them to Europe!! What a wonderful visit with children. We’ve never been to Paris and having two young daughters, I honestly have put it off on my bucket list for later in life travel. I might start thinking about planning a visit because of the fun you had with your two young children! Such a fun trip! We went to Paris in March with our 5 year old and had a blast. I’m surprised to hear about the food! We didn’t experience that and they didn’t try to offer us anything special for our daughter. She ate pate and escargot right along with us, without batting an eye! BTW, you should join my FB group (Tiny Globetrotters). 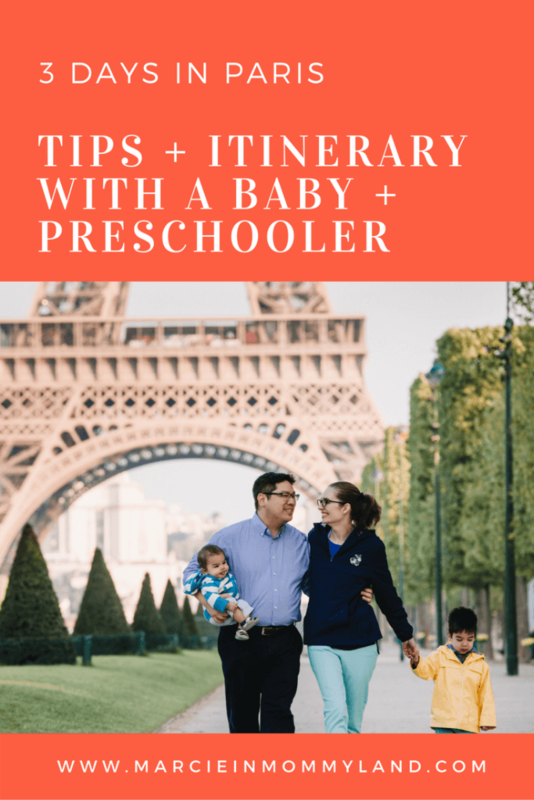 Lots of parents on there who travel with little ones and Paris comes up a lot! Thanks! I just requested to join Tiny Globetrotters! I wonder if he was offered hamburgers because our son was 3? He eats pate and foie gras at home and usually eats the same food as us. Sounds like you had a lovely time!! The idea of travelling with kids really scares me, I haven’t done it before! You make it sound easy though – your photoshoot seems like a lovely idea too so keep those memories! The photoshoot was one of our favorite activities! Yes! It’s always better to see how someone else has done it successfully! Great tips. I really liked how you guys chose to ride the carousel instead of wait in the cold for something your kids might not enjoy as much. More people should just do that in general. Also, crazy about the food, how they always wanted to give the kids Hamburgers, I definitely think that sharing would be the way to do. Yes! We learn more and more each trip we take. I don’t have children and have been traveling as a solo traveler for years, but a few years ago when I got married my travel changed a bit. My wife has adult children, but now we need to make accomodations to take in consideration little kids because she has several young children. It has been different for me but rewarding at the same time. I will certainly put these tips to use. Also, all of you look so happy in all of the photos. What a wonderful trip! I love that you took the kids. I think starting them off traveling young benefits them in so many ways. They look like they had so much fun. It makes me want to start planning my Paris trip. Thanks for all the helpful info. I agree! Hope you get to Paris soon! This post brought up two really conflicting emotions. Firstly, as a child, and a very young one at that, Paris was the first trip I went on and while I can remember very little of it, my parents still speak of it very fondly and how much of a good time we all had there. Now, as a part of one young child, I am in awe of how tackle the city with two! Some great snaps though and the little one is très mignon! That’s so awesome that your parents traveled with you! It’s a different mindset traveling with little ones, but we’ve made so many fond memories ourselves! 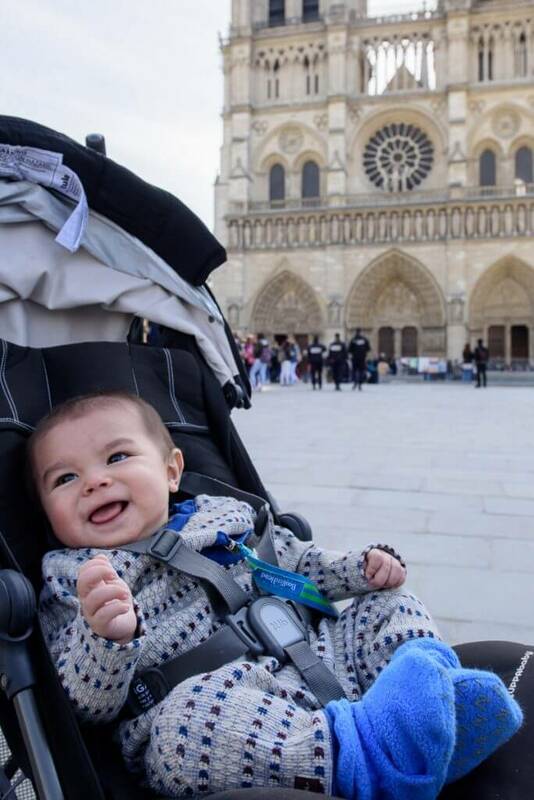 First of all its awesome how you manage you toddler and infant and managed to roam about Paris for 3 days! 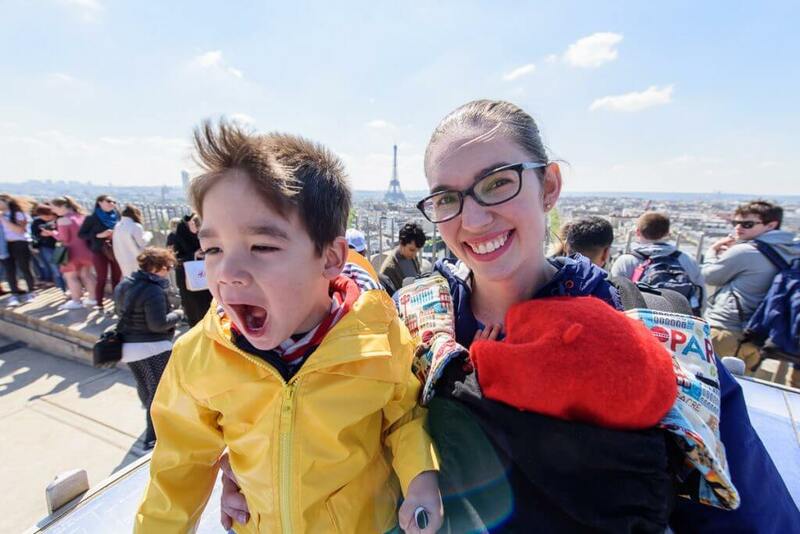 The view of the Eiffel from Arc de Tromphe and your toddler’s expression is just wow! He’s been talking about the trip constantly since we’ve been home! So this post was so nostalgic! Aw! That’s so cool that you remember Paris when you were 4 years old! Such a different experience as an adult, I bet! Thanks! It was a great way to expose our kids to French culture. Great guide! And a lot of things I’d not even considered. I can’t imagine only being able to get flavored formula (don’t think I know a single mum who uses flavored!) and I’m glad to hear that nursing in public isn’t a problem. That’s always a good one to know in a new country/city. It sounds like you all had a great time. The medallions seem like a brilliant idea for little ones as they do love their souvenirs! I think I would be as irritated as you at people assuming that toddlers only eat burgers and fries – Paris is/was known for its fantastic foods so I think it’s a real shame if you get ‘forced’ to exclude children from that aspect of the trip. Yes! We must come across as “burger and fries” tourists. Not sure how to combat that in the future. But, we’ll be sure to speak up and order the foie gras! Seeing Paris by tuk tuk sounds like a unique experience – the kids much have loved it! 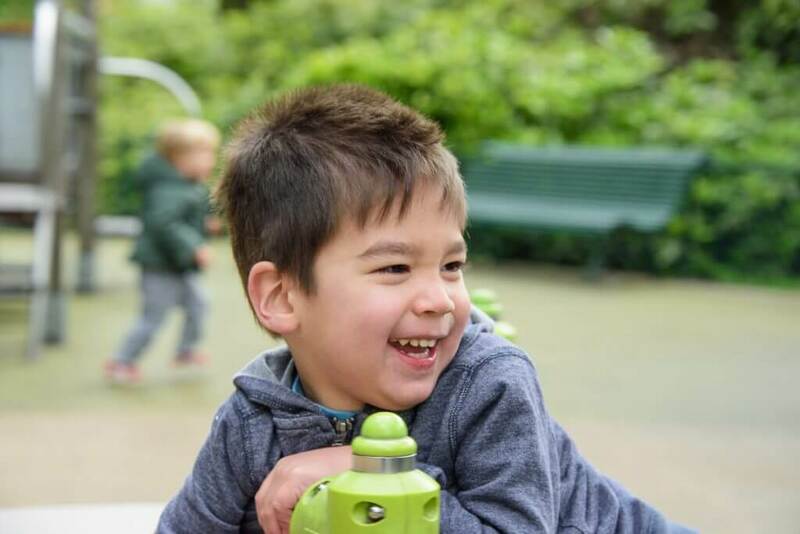 Jardin du Luxembourg is one of my favourite places as well – sounds like your family had a great trip! Paris by TukTuk was super fun and quite a novelty! This sounds like an amazing trip! I would love to visit Paris and I’m sure my son would love it too! I really like you laid everything out and provided concrete suggestions for daily activities. Super helpful to anyone planning a similar trip! Looks like a great trip! I’ve never been to Boulogne but sounds like something I should add to my next trip. It’s always fun to see where the locals actually live! PS that pic of the kids in their berets is too cute! This looks like so much fun! So impressed you did all that with two kiddos! And we did it at a leisurely pace, which worked well for the whole family! Kudos to making it to Paris with your kids! And I love the idea of having a photographer around to take some family photos! Flytographer is seriously a brilliant idea! What a precious trip! Paris looks amazing from your point of view and its amazing how you can balance travel and family so well! Thanks! It’s a bit of a balance, but totally worth it for our family! What a great read. It fascinates me to read about travelling mums. I am not a mum myself but often read posts about it. I think that it is a great thing to do. If I ever have kids, I want to show them the world too. It’s the best education for sure. Thanks so much for your kind words! It really is the best education no matter where you go! Aww! Your kids looks like they enjoyed Paris very much! It was such a memorable trip! We’re going to Paris for 3 days this summer so this was a very useful itinerary for me even though I don’t have any kids 🙂 I’m very excited!! Yay! It’s pretty universal, I just added in very kid-specific things to look for. Have the best time ever! I would have been nervous about doing Paris with young kids, but they (and you) look like everyone had FUN! Wow, what a wonderful, thorough post! I commend you for being so brave and taking your littles to Paris! I hope to have grand adventures with my kids soon. It’s really special to bond with your kids over travel. I recommend it! This looks like such an amazing adventure! Makes me *almost* feel like we could plan a destination vacation with our kids. Loved reading about your trip! Hahaha! Sometimes it’s good to test drive somewhere closer just to see how your family travels. Never knew they have tuk tuk in Paris, so cute! Your itinerary sound amazing and relaxing at the same time. The TukTuk was so much fun! This looks like it was so much fun! Glad you had a great time, I think you are so brave for traveling with two little ones!